It’s got a bit snowed under by all the recent studies in which BCAAs inhibit muscle breakdown during intensive exertion, but originally supplements manufacturers brought BCAAs onto the market at an energy supplement for athletes. They were on the right track, according to an animal study by amino-acid producer Ajinomoto from 2006, which showed that rats given extra BCAAs, glutamine and arginine voluntarily clock up more metres on a treadmill. 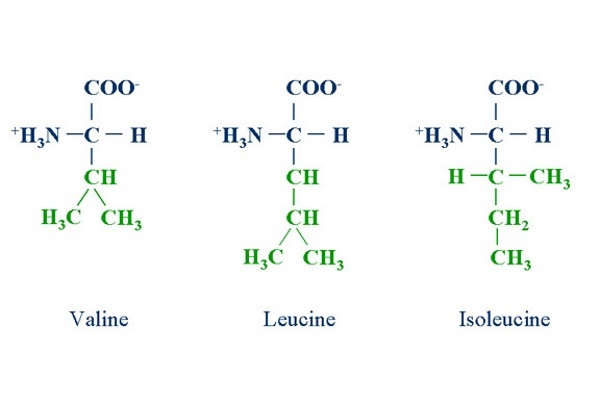 Physical exertion causes muscle to convert amino acids into energy. To do this the muscle cells use BCAAs, branched-chain amino acids, where possible. For the enzymes involved in energy provision, the branched side chain is like a handle: it gives them a better grip. Because of this, taking BCAAs before and during a training session reduces muscle breakdown. The muscle cells convert the additional BCAAs into energy, thus saving the BCAAs in the muscle proteins. Another ergogenic effect of BCAA supplementation is that it reduces fatigue. The mechanism here is a little more complicated. When muscles are active they absorb BCAAs from the blood. They don’t absorb the amino acid L-tryptophan, so tryptophan molecules remain in the blood. The brain also absorbs amino acids from the blood, but the amount of amino acids that reach the brain is limited. If physical exertion reduces the amount of BCAAs in the blood, then the amount of tryptophan molecules that reach the brain increases. Enzymes convert tryptophan there into the neurotransmitter serotonin. A peak in brain serotonin levels during training causes drowsiness and fatigue. So the remedy for tiredness is obvious: make sure there are more BCAAs in the blood. The researchers wanted to test this theory, so they gave a group of rats feed containing two percent BCAAs. A control group was given food containing extra glutamine. The rats had a treadmill in their cage. The Japanese recorded the number of metres the rats ran on the treadmill and they saw that the BCAA group became more active. In another experiment the researchers gave the rats two bottles of drinking water in their cage. One bottle contained ordinary water and the other contained a solution of BCAAs, L-glutamine and L-arginine. The water contained per litre 15.2 mmoles L-leucine, 9.9 mmoles L-isoleucine, 11.1 mmoles L-valine, 16.6 mmoles L-glutamine and 13.9 mmoles L-arginine. As the experiment progressed, the rats drank more of the water that contained amino acids and less of the ordinary water. At the same time they ran further on the treadmill. In another experiment, water with amino acids added prevented the concentration of serotonin in the brain from increasing as a result of physical exertion. In that experiment the rats had to run for 55 minutes in a treadmill, after which they were given 8 ml water – with and without amino acids. In the lateral hypothalamus [LH] of the rats that had been given extra amino acids, less serotonin was released than in the rats that drank ordinary water. Do you get tired during your workouts? Why not try BCAAs? J Nutr. 2006 Feb; 136(2): 548S-552S.